Oktoberfest is a 16-18 day festival held each year in Munich. It is the largest (public) festival in the world, each year attracting over six million visitors (72% Bavarians and 15% tourists). Traditionally, the festival begins on the first Saturday after September 15th and ends on the first Sunday in October. If the first Sunday in October is October 1st or 2nd, then the festival is extended to October 3rd to include the German Reunification Day. The festival in Munich consists of lots of beer and food, served in huge tents owned by different breweries, restaurants, and other establishments. There are bands playing tradtional Bavarian music, as well as modern bands in the evening hours that play rock, pop, and dance music. To keep with tradition, many visitors wear the tradtional clothes: Lederhosen for men; Dirndl dresses for women. Many amusement rides also provide visitors with additional excitement - these include a ferris wheel, roller coaster, and many other rides. Oktoberfest celebrations throughout the United States commemorate the world-famous and time-honored Oktoberfest in Munich. The U.S. Oktoberfests celebrate German culture, heritage, and traditions and most try to incorporate as much of this into their festivals as possible. Each Oktoberfest celebration here in the U.S. is unique in that it offers its own schedule of entertainment, foods and beverages, and its own local flair. However, at most Oktoberfest celebrations, you will find live Bavarian style music (such as German brass and oompah bands), performed by either local bands or international touring groups. You will also find authentic German foods, many of which we have listed for you (right). You will also find beer from German, local, and/or American brewers. In addition to the food, beer, and music, the Oktoberfests usually also offer their guests a variety of entertainment. This may include parades with colorful floats, marching bands, and celebrities. This may include beauty pageants, marathons, walks or runs, baking contests, arts and crafts, carnival rides, and children events. 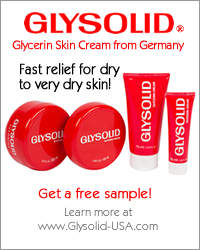 There many also be a marketplace where German-related goods can be purchased. To find an Oktoberfest celebration in your area, use our Oktoberfest search feature above. Beer is a major part of the Oktoberfest. In Munich, the breweries brew a special Oktoberfest beer (Wiesn Märzen) for the festival. This beer is slightly darker and stronger in taste and alcohol. The six Oktoberfest breweries are Spaten, Augustiner, Paulaner, Hacker-Pschorr, Hofbräu, and Löwenbräu. Oktoberfest celebrations here in the U.S. may incorporate Oktoberfest beers from Spaten, Paulaner, and/or Hofbräu. They may also offer a variety of German beers beyond just the Oktoberfest style. You will also find American beers, both local and national brands. 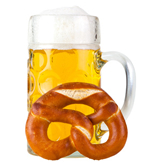 For more details on Oktoberfest and other German beers, please visit our beer section. 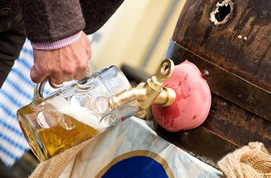 Festivals held in October have long been a part of Bavarian history. October was the time that the Märzen-Beer was ready for consumption and this was a reason to celebrate. However, the large Oktoberfest in Munich we know today dates back 200 years. On October 12, 1810, Crown Prince Ludwig (later King Ludwig I) and Princess Theresa of Hildburghausen got married. To celebrate their wedding, the couple organized a huge horse race, which took place on October 17th. The horse race took place on a field within the city walls. The name of this field was later changed to Theresienwiese, meaning Theresa's field. The Crown Prince was very interested in ancient Greece and told his subjects to fashion the horse race after the ancient Olympics. The idea was received with excitement, giving the original Oktoberfest a sporty atmosphere. The couple decided to repeat the horse race every year at the same time, much to the delight of Munich's residents. Thus began the tradition of the Oktoberfest. In 1813, the festival was cancelled because Bavaria was involved in the Napoleonic War. However, after that, the festival quickly grew larger and larger. Addtional entertainment was added, such as bowling alleys, swings, and merry-go-rounds. Booths were added were visitors could win porcelian, sliver, and jewelry. By 1819, the management of the festival was taken over by Munich city officials and the Oktoberfest was to be organized by them every year from then on. By the end of the 19th century, the Oktoberfest was lengthened, beginning in mid September to take advantage of the month's warmer weather. Since then, only the last week of the festival as held in October. In 1880, the city government gave its permission to serve beer at the festival. To go with the beer, in 1881, the first bratwurst producer, Hendlbraterei, was invited to the festival. Around this time, electricity was added to the tents and booths. To make room for the growing number of visitors, the breweries built large beer halls. Over the next several decades, the Oktoberfest continued to grow. By 1960, the Oktoberfest was the largest festival in the world. It was also in this year that the original horse race was removed from the festival. The Oktoberfest has been held almost every year since the original festival in 1810. The following are the years in which no Oktoberfest celebrations were held. 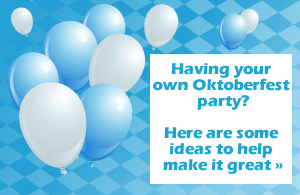 1919 - 1920 - After World War I, Munich celebrated with a smaller "Fall Festival"
1946 - 1948 - After World War II, the Oktoberfest was again reduced to a smaller "Fall Festival"
Please select a state below to find an Oktoberfest celebration nearest you. Our directory now includes Canada! In addition to the beer, visitors to the Oktoberfest can enjoy some very traditional Bavarian dishes. Here, we list some of the foods that are served at the Oktoberfest in Munich - many of which you will find at Oktoberfest celebrations throughout the U.S.
At exactly 12:00 noon on the first day of the Oktoberfest, the Mayor of Munich taps the first keg of beer and yells "O‘zapft is!" ("the keg is tapped"). This officially declares the festival open. A popular tradition at Oktoberfests is to have a toast before drinking. This is called "ein Prosit". People will often say "Prost" or "Prosit" ( meaning "cheers") or "Zum Wohl" (meaning "to your health") while clinking beer glasses with everyone sitting at the table. There is even a popular Oktoberfest song which uses the phrase too ... "Ein Prosit, Ein Prosit." The Oktoberfest in Munich takes place on the Theresienwiese, a field named after Princess Theresa of Hildburghausen. To locals, this field is know as "Wiesn" for short. 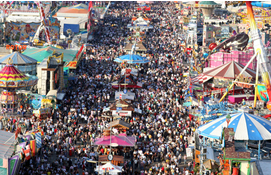 During Oktoberfest time, however, locals use the term "Wiesn" to refer to the Oktoberfest.